Experience all of Asia, especially the food! Would you like to travel to one place and learn about all of Asia at once? Malaysia is the place for you to travel and explore! Malaysia is a microcosm of all of Asia. In addition to the Malay culture, language, and food, you can experience Chinese and Indian culture as well, along with their great culinary offerings. For example, if you want to try some of the best Chinese food around, go to Ipoh. If you are looking for exceptional Indian food, go to the Little India area of Klang. Of course, both Chinese and Indian food, along with great Malay food such as satay, are available throughout the country. You really can’t go wrong. In general, you will find all three cultures in nearly every location as you travel in Malaysia. You will normally find English speakers nearly everywhere as well, although it is a good idea to know a few key phrases in the national language of Bahasa Malaysia. For instance, the Malay word for the restroom is “tandas”, and the word for water is “air”, pronounced AH-EER. And if you see a sign that says “AWAS”, that means danger. Those three words would probably get you by, along with the prevalence of English speakers. In addition to Malay, it is easy to find people who speak in Chinese and Indian dialects and languages. Malaysia is also a land of contrasts. You can visit the jungles and beaches to see great natural wonders, or you can visit the metropolitan areas for a taste of city life. 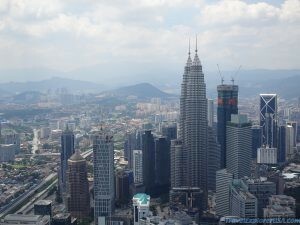 The largest metropolitan area is Kuala Lumpur, also known as KL. Malaysians like to use letter abbreviations for city names, and it really helps if you’re unsure of the pronunciation. In KL, you can visit the Petronas Towers, the twin towers which was once the tallest building in the world. At the towers’ base is a fantastic shopping mall, a part of the town center known as KLCC. It is possible to go up to the walkway that joins the two towers, but you have to arrive early in the day for a ticket. If you want to get a birds’ eye view of the city, we recommend the KL Tower, which offers a breathtaking view. If you are brave enough, they even have a see-through floor on a balcony, and you can take your picture looking like you are suspended in midair above the city. Of course, walking out on such a structure is not for the faint of heart or anyone who is afraid of heights. If you can handle it, though, it is an awesome view. We will have more posts following about other great things to do when you visit KL. Other great cities include Penang and Melaka. You can visit Penang for some wonderful beaches and a look at the British colonial architecture and historical sites. Further south on the west coast is Melaka, where you can find historical sites from both the British and Dutch colonial periods. Both cities have nice beaches, too. If you want to see the palm plantations, you can view the as you leave the KLIA airport and come to the city. To get a quick look at the jungles, you can see them along a train ride between cities in some locations. Ask the locals for directions to nearby waterfalls for a spectacular site. Of course, the best place to see the natural wonders is in East Malaysia, on the island of Sarawak. To see the traditional Malay homes, which look like houses on stilts, drive along the coastal highway of the west coast. It’s a great way to experience the culture a bit while avoiding the hustle and bustle of the main highways. If you are looking for a great beach vacation, your best bet is Langkawi. It is actually a group of islands off the west coast. The beaches have wonderful sand and great views, and there are a lot of activities available as well. Westerners can feel very comfortable in Langkawi. Both the east and west coast have wonderful beaches. However, in some places on the beautiful beaches on the east coast, westerners should be careful to follow any dress code rules so as not to offend the majority Muslim population there. Be sure to check out our others posts about specific locations to visit in Malaysia. There is a lot to see in a relatively small area. It is truly a great way to experience a microcosm of Asia in one place.